Q: I have tried to recreate this ready meal (chicken and broccoli dish) from Woolies but without success. Any suggestions? A: I am not sure what dish it is but if you are looking for something with Broccoli and ChickenI would suggest the recipe below although it does not have chicken in this dish it is an easy addition, simply Slice 2-3 breasts and fry until just cooked and the continue from (Pasta) step 2 in the recipe below. This is a quick version of a classic Italian dish called tagliatella alla Genovese. Its not known practice to put potato shavings into a pasta dish but adding shavings and mash are a very authentic way of creating a wonderful creaminess and an amazing taste. Why not try it? Put the basil, pine nuts and salt in a morte and pestle and grind until a paste has formed. Add the Parmesan and pound until it has been soaked into the basil. Slowly add the olive oil, mixing continuously until the desired paste has formed. Bring a Large pot of water to the boil. Add ½ a handful of sea salt and allow to come back up to the boil. Add the pasta and broccoli stalks and stir in, allow to cook for ±8 minutes. 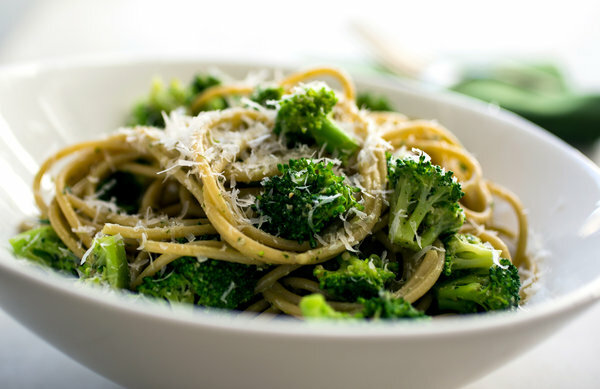 Add the broccoli florets and potato slices and leave for a further 2-4min (important not to over cook your pasta) then strain well reserving some of the cooking water. Transfer the cooked pasta to a large warm serving bowl and toss in the chopped basil, basil pesto and Parmesan. Mix in well. If the sauce is to thick add some cooking water 1T at a time until the desired consistency is achieved. Season with salt and pepper and then garnish with the remaining basil leaves and Parmesan. TIP: to create different pestos just add different “main ingredients” e.g. sun dried tomatoes, roasted peppers, roasted butternut, different fresh herbs i.e. ; coriander, mint, rocket. Wickedfood cooking school runs Johannesburg cooking classes throughout the year at its purpose-built cooking studios. Cooking lessons are run in the mornings and evenings 7 days a week (subject to a minimum of 12 people). This team building venue is also popular for corporate events and private functions – team building cooking classes, birthdays, kitchen teas, and dinner parties with a difference. Our cooking courses are hands-on, where every person gets to participate in the preparation of the dishes. They are also a lot of fun where you not only learn new skills, but get to meet people with similar interests. For corporate groups and team building cooking classes these events are a novel way of creating staff interaction or entertaining clients. thanks but i hate broccoli 😀 Although attending a cooking lesson i learnt how one can substitute certain ingredients. Loved this recipe!! kids, wife, mother-in-law!! Want to do more cooking classes with you guys! FHyL4m I really enjoy the article post.Really looking forward to read more. Cool. H8Ijxf Im thankful for the blog post.Thanks Again. Want more.